The tenor bell of the 13 bell chime was given by parishioners in memory of St John’s longest serving Rector, the late Venerable Archdeacon W. J. Gunther who served as Rector for 43 years from 1867 to 1910. The remaining bells were gifts of families associated with St John's . The ceremony of the dedication and the unveling of the memorial tablet was performed by the Archbishop of Sydney in front of a crowd of 4000. Archdeacon Gunther was active in developing the church in the western areas of Sydney Diocese. He was invited by the Dioceses of North Queensland and the Riverina as Bishop but declined, choosing to remain in Parramatta where he contributed greatly to the life of the community, as an active member and President of the Hospital Committee and the Parramatta Benevolent Society, and as a founding member of the Agricultural and Horticultural Society. He was a writer and historian, publishing histories of the Church in Australia, of Samuel Marsden, of The King's School and of St John's. In 1902, he was appointed as the Vicar-General of the Diocese of Sydney, and later as Archdeacon of Camden. Arrangements are being completed for the erection in the twin spires of St. John's Church of England, Parramatta, of a full set of 13 church bells. A scheme to secure these bells was put forward by the rector (Rev. S. M. Johnstone), rural dean, at the commencement of this church year. It was at once enthusiastically taken up by the parishioners. It is hoped that during a special visit to the old town in about the middle of October, the Archbishop of Sydney will at a special service receive and dedicate the special offerings of the parishioners; some are subscribing bells as memorials to late members of their own familles, who fell in the war; or well-remembered late church officers, or other old-time worshippers in the historic church. There was a large attendance at St. John's Church, Parramatta, on Saturday for the ceremony of the dedication of the bells which have been installed in the southernmost of the towers of the well-known twin spires of the parish church, the oldest sacred building of the kind In Australasia. Among those present were many former parishioners, clergymen, and church officers of St. John's. 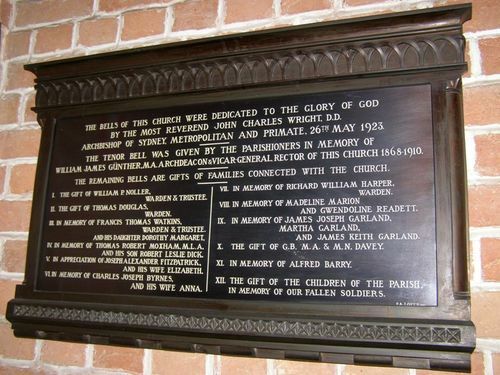 The ceremony of dedication-together with that of the unveiling of the memorial tablet erected in the church in connection with the establishment of the new peal-was performed by the Archbishop of Sydney. The Sydney Morning Herald (NSW), 28 May 1923. Archbishop Of Sydney, Metropolitan And Primate. William James Gunther, M.A., Archdeacon And Vicar General. Rector Of This Church 1868 - 1910. The Remaining Bells Are Gifts Of Families Associated With St John's.